After only a week Fairlands Valley Spartans returned to Cassiobury Park, Watford for a cross country race. Seven days ago it was separate men’s and women’s races for the senior county championships, this time it was all in together over about 9.5 kilometres for a Sunday Cross Country league event. The outstanding Spartan performance came from CALLUM STEWART who was second overall out of more than 400 finishers in just 34 minutes 4 seconds for the six miles or so, but the amazing YUKO GORDON continues to astound. 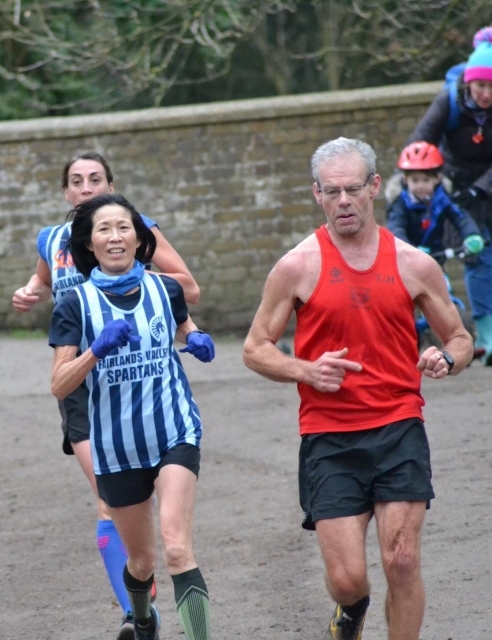 She’s a veteran 65 plus women and her time of 46 minutes 38 minutes made her first female from Fairlands and eighth out of the 31 runners from the club. SIMON JACKSON and TODD GRAY also beat 40 minutes and were in the top 60 with Simon 13th in 36:27 and Todd 57th in 39:59. The rest of the men’s “A” team consisted of RICHARD SPRINGALL 84th in 41:30; THOMAS SAUKA 113th in 42:55; TIM SABAN 114th in 42:57; STEVE MAYFIELD 151st in 45:22 and GARETH POWELL 191st in 47:28. Men’s teams consisted of eight runners. No less than three Spartan women’s teams completed the rest. The “A” team were Yuko; SUZY HAWKINS 179th in 46:47; MICHELLE REEVES 214th in 48:33; CLAIRE EMMERSON 260th in 51:22 and new club chair SOPHIE COWAN 299th in 54:02. JENNY GARRETT led in the women’s “B” team at 320th in 55:02. She was supported by KAREN PALMER 326th in 55:26; KELLY McHALE 332nd in 56:30; PENNY SCHENKEL 345th in 57:22 and CAROLE SHELDRICK 367th in 59:59. Women’s teams consisted of five runners. There were 17 FVS women and 14 men. All the Spartans results can be found at the end of this release. Fairlands Valley Spartans have entered fourteen runners for the national cross country championships on Saturday 24th February. They will be on the tough, hilly and usually Parliament Hill Fields in north London. The club have teams in the senior women’s and men’s races. The final league race will be on Therfield Heath, Royston on Sunday 18th February. Running his first ever marathon, Michael Andrews made his way through Walt Disney World, Florida in a very good time 5:14:41. Wife Aimee Andrews also in her first ever marathon persevered excellently to stay inside the seven hours cut-off time, finishing alongside her dad Paul Holgate in 6:57:09. Do you have an entry to the London Marathon on 22nd April 2018? Have you thought how you will get to London from Stevenage on the big day? Fairlands Valley Spartans have a coach from Stevenage and there are spare places. The cost is just £10. If you would like to join us, please contact Roger Biggs on roger@thebiggs.net. SAM SIMMONS ran the Snetterton 10K in 53 minutes 33 seconds. He finished 304th out of the 760 finishers. Fairlands Valley Spartans applied for the England Athletics Club Run scheme in September 2017 and found out at the end of the year that they had been selected. The Club Run scheme provides a series of three visits from an England Athletics Coach, over a three month period. The aim is to provide some additional coaching to club members and to support coach development. The first of three visits from coach Simon Mennell was on Tuesday night. They was an amazing turn out for a whole club session of over 50 runners. This was an 800 metres endurance session, with each group having a pace to aim to maintain over their reps. Everyone enjoyed the session and benefited from Simon’s coaching. He then spent some time with the coaches, discussing different practices and techniques. The feedback we have received from members has been brilliant – everyone enjoyed the session and we are really looking forward to Simon’s next visit on Thursday 1st February. Why not train with the Spartans? Have a look at www.fvspartans.org.uk? JOHN HARRIS ran the great Edinburgh winter run 5K in 20 minutes 38 seconds. Parkrun Highlights: At Stevenage MADDIE PRITCHARD was first woman to cross the line, finishing in a time of 22:28. CLAIRE EMMERSON also claimed a top ten finish in 25:21 with VERITY FISHER (27:27) and CALLIE CHAPMAN (30:21) the next Spartan women home. For the men, recent recruit DANNY SCANLON was 6th in 20:06, with MARTIN DUDLEY gaining a top 50 finish in 22:42. LEE PICKERSGILL (24:01) and CLIVE CANNON (25:20) were next. 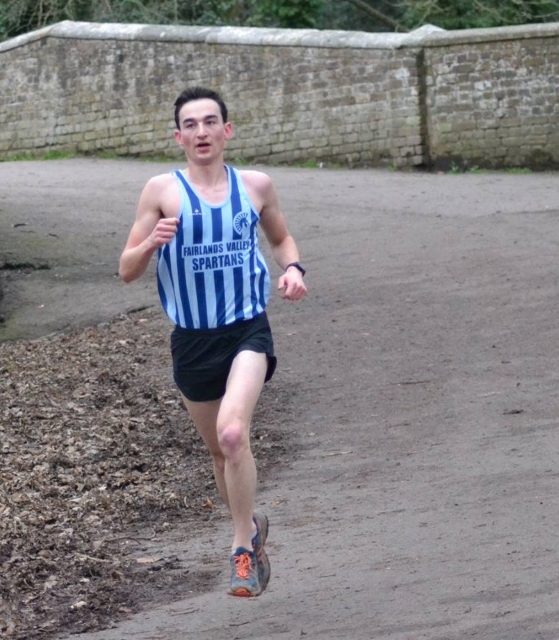 Best performances away from the “home” venue were by CHRIS HOLLAND, who ran 21:50 in finishing 10th at Pymmes, and DAVE SMITH who was 15th at Linford Wood in a time of 21:18. 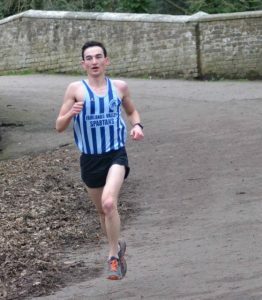 Fred Hughes 10 miles including senior county championships at St. Albans on Sunday 21st January. Southern Cross Country Championships on Saturday 27th January. Watford Half Marathon inc. veteran county championships on Sunday 4th February. Bramley 20/10 (20 miles or 10 miles) on Sunday 11th February. St Valentine’s 30K at Stamford on Sunday 11th February. Cross Country League at Royston on Sunday 18th February. Fairlands Valley Spartans Champions Night on Friday 23rd February. National Cross Country Championships, Parliament Hill Fields on Saturday 24th February. Baldock Beast on Sunday 25th February. Welwyn Half Marathon on Sunday 4th March. 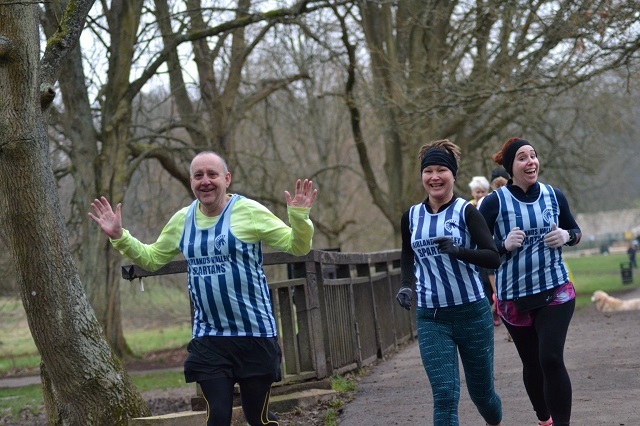 Milton Keynes 5K and 10K on Sunday 11th March. Finchley 20 miles (including Herts County) on Sunday 18th March. Oakley 20 miles on Sunday 18th March. Orion 15 classic cross country at Chingford (Epping Forest) on Saturday 24th March. County Cross Country Championships for Veterans at Royston on Sunday 25th March. Maidenhead Easter Ten on Friday 30th March. Sandy Ten on Sunday 8th April. London Marathon on Sunday 22nd April. Flitwick 10K on Sunday 29th April. Stirling Marathon on Sunday 29th April. Welwyn 10K including senior county championships on Sunday 24th June. Standalone 10K on Sunday 7th October. Peterborough Half Marathon (GER) on Sunday 14th October. Spartans at Watford Cross Country League race, Sunday 14th January.